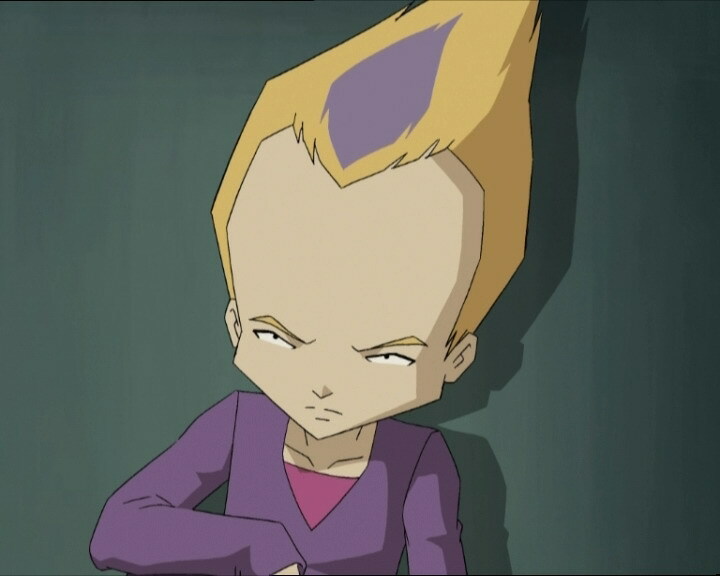 Jeremy creates a polymorphic specter of himself to go to phys ed class in order to be left to work undistracted on bringing William back from Lyoko. Jeremy’s body double turns out to be far more athletic than the original, to Jim’s considerable surprise. But Xana wrests control of the tower Jeremy used to conjure up his clone, and the imposter now poses a serious threat to our heroes. 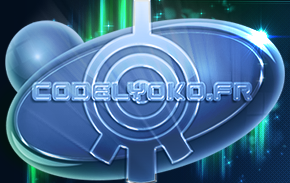 A battle ensues on the now fully reconstructed Lyoko, featuring new, updated gear for the Lyoko Warriors. The episode commences in Jeremy’s room. Odd is telling unfunny jokes while Jeremy tries to recreate the rest of Lyoko. 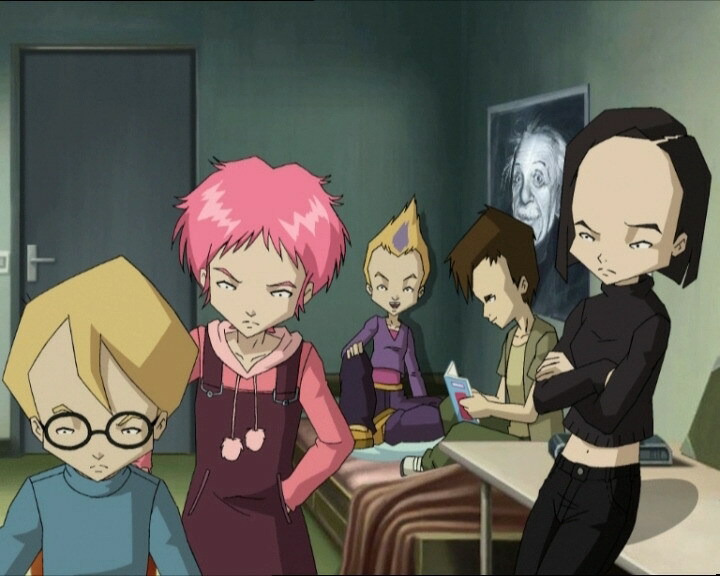 The gang ask themselves what they should do about William, who is still on Lyoko under XANA’s control, so that nobody will notice his absence at school. In Mr Delmas’ office, the principal is playing a game on his computer when the phone rings. 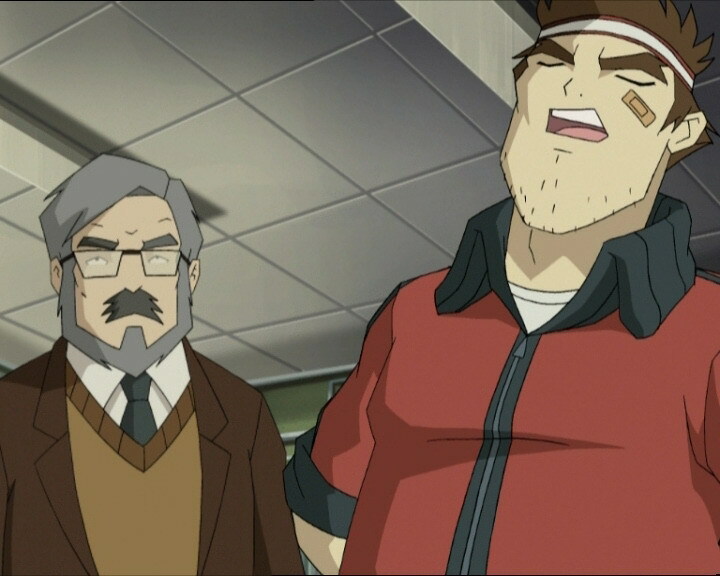 It’s Jeremy, once again using the voice of James Dunbar, William’s father, to say that he will be absent for another week due to him being bedridden with a high fever. The principal doesn’t pay much attention to the conversation as he does his game, but gets the message of the call before hanging up. Back in Jeremy’s room after the telephone call with the principal, Odd says that they can finally move on to the more important things. Jeremy seems to understand what he’s trying to say and replies that he doesn’t have time, Odd would like some new pants and therefore some new equipment. Jeremy tells him again that he has other things to do, to which Odd responds that it’s his job. Back in the principal’s office again, Nicole, his secretary, manages to win the game Mr Delmas was playing earlier, making him annoyed. The phone rings again, but this time it’s the real James Dunbar calling because he’s worried he hasn’t heard any news from his son in a few days and his mobile isn’t answering. Mr Delmas responds sarcastically that he’ll do everything he can to find his son: call the army, the FBI, even the President. Mr Dunbar responds that all that’s not necessary, and the principal then tells him that he knows it’s a crank call and hangs up. He then tells Nicole that that’s how you deal with jokers playing tricks on you. However, she asks him how he knew that caller was the prank and not the person who called earlier. Mr Delmas, followed by Jim, enter the cafeteria and walk up to Yumi to ask her if she has any news about William. She then gives Jeremy’s version of the story, that he’s bedridden because of a high fever. This response doesn’t satisfy the teacher, who then makes her understand that if William isn’t back by that night, the principal will call the police. So Ulrich tells Jeremy, who is still in his room, about the situation, and decides to work on a program all afternoon to save William from XANA’s grip. But Ulrich reminds him that they have PE class that afternoon and that he can’t be absent or there will be consequences. Jeremy begins to think up a solution to this, saying he’ll improvise and find a way to be in the lab and in class at the same time. Later, Aelita, Yumi, Ulrich and Odd are in front of the drinks machine when Jeremy joins them. He behaves strangely and they surmise that it must be one of XANA’s clones. Odd charges at it but ends up being thrown into the drinks machine. 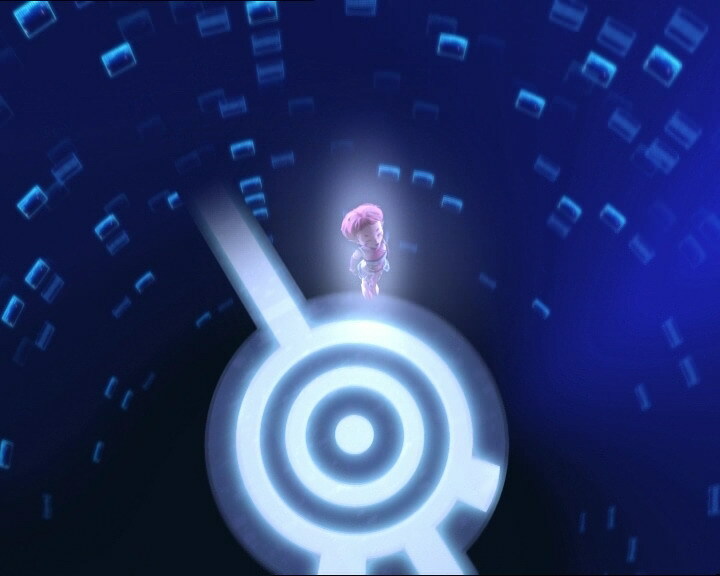 Yumi’s phone then rings, Jeremy on the other end saying that he created a double of himself using an activated tower on Lyoko so that he can work in the lab and go to class at the same time. During PE class, Jim is astounded by the fact that Jeremy himself has honoured him by attending his class. 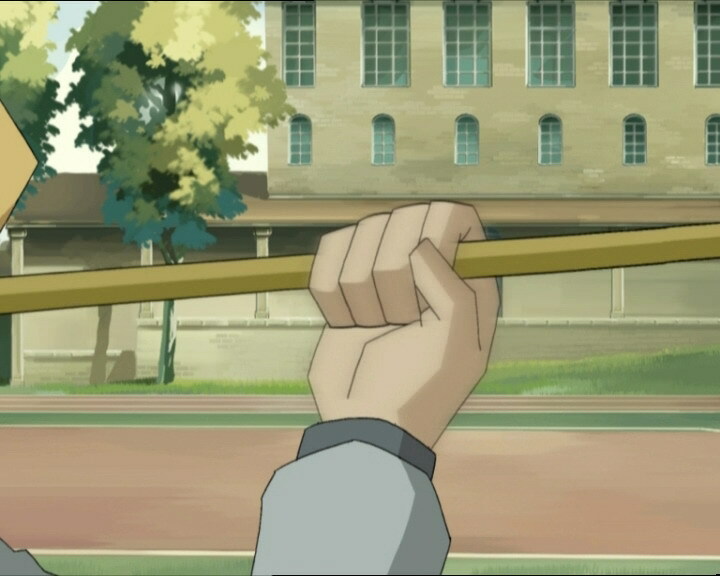 He forces the clone to do shot-put and it ends up sending the object through the window into Ms Hertz’ class. Jim can’t believe his eyes and bumps Jeremy up to champion level. At the same moment, the real Jeremy continues work on his program when three Tarantulas accompanied by William approach the tower he activated. 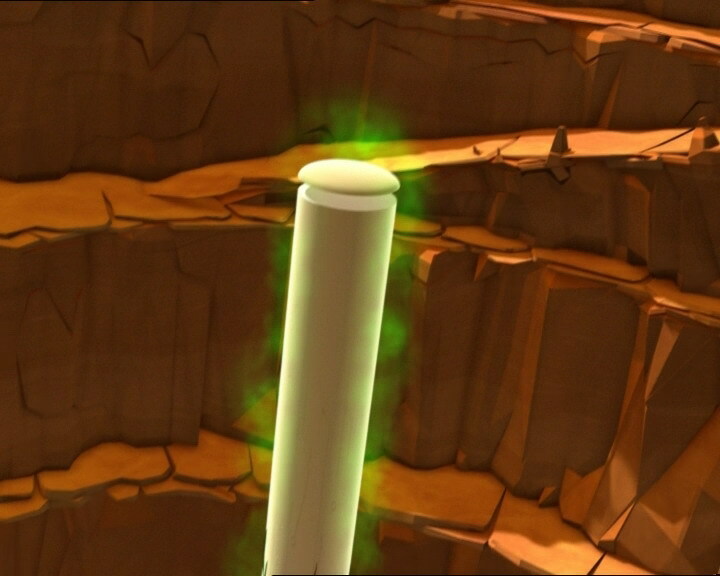 William then begins to levitate, the symbol of XANA appearing on his forehead, and does something to the tower. 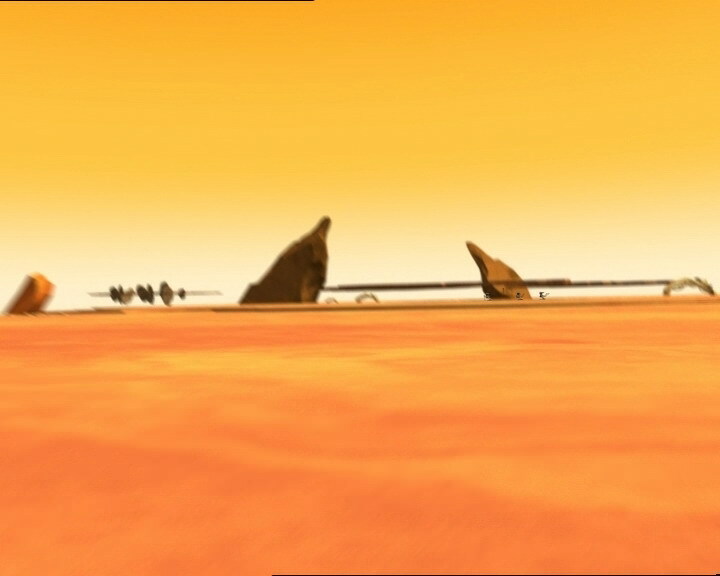 Jeremy then calls Ulrich while the clone prepares to throw a javelin to inform him that XANA is trying to take control of the tower and the clone. For the second time, XANA tries to take control of the tower and Jeremy tries to take it back. Jim sends his champion, Jeremy’s clone, to the infirmary accompanied Odd, Aelita and Ulrich, who volunteer to take him. 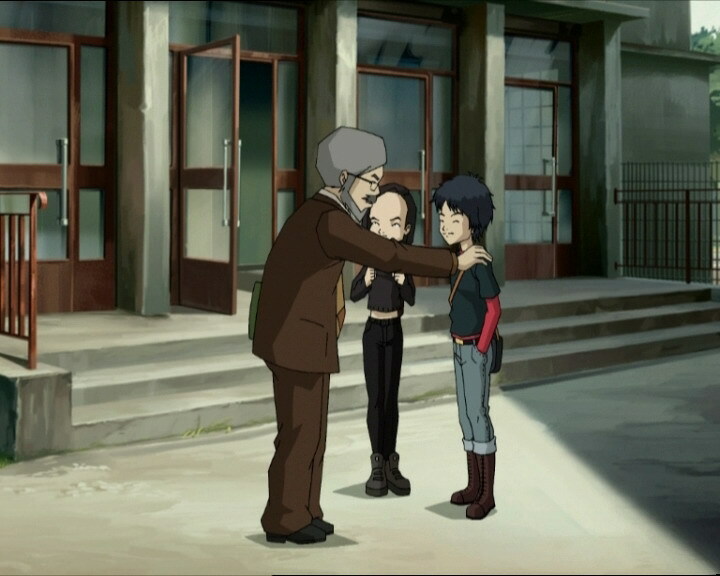 Aelita and Ulrich go to the factory with Yumi, who they call to warn, while Odd is in charge of the clone. He leads him into a room and blocks the door with a wall of lockers. 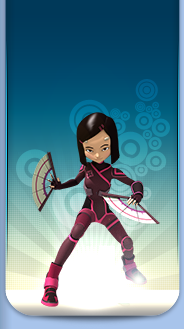 Aelita, Yumi and Ulrich go to Lyoko where they discover their new costumes. They make it to the tower on the Overbike and Overwing. Meanwhile, the clone tries to escape its improvised cell while Odd tries to hold it back. In the end, it manages to free itself and leave the building, Odd having no chance to stop it. He then sets off on its heels and informs Jeremy that the clone is headed for the factory. 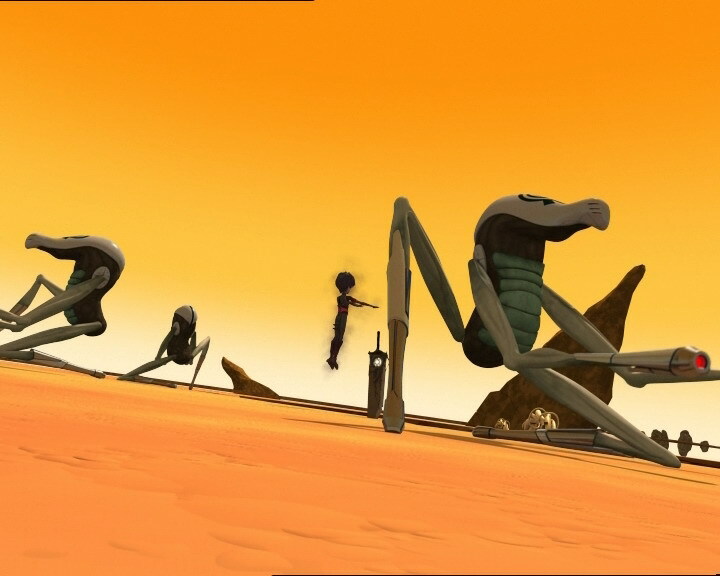 On Lyoko, two of the Tarantulas attack Yumi and Aelita, who fall from the Overwing. 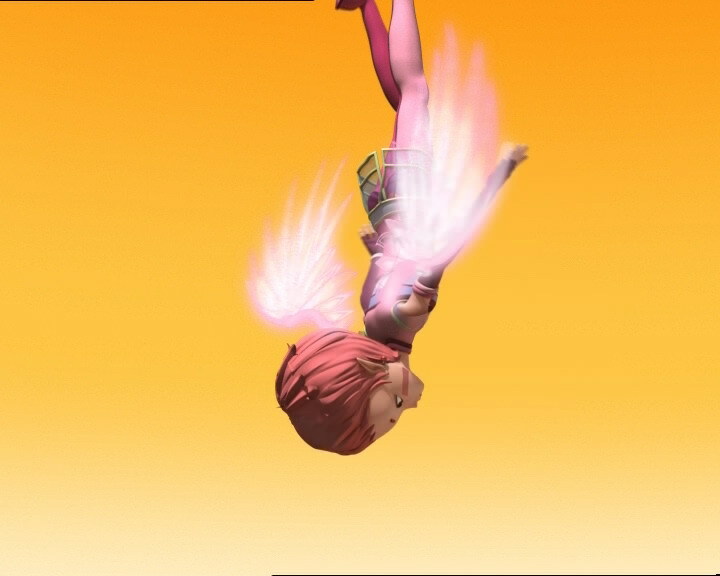 Aelita, in freefall, suddenly has two wings appear on her back: a surprise Jeremy prepared. She then flies to help Yumi. At the same moment, Ulrich and William fight, but the latter holds the advantage. During this time, the clone arrives in the lift and descends to the lab. Yumi is fighting a Tarantula. Ulrich is devirtualised in one hit by William. Aelita, still in the air, fights two of the Tarantulas. 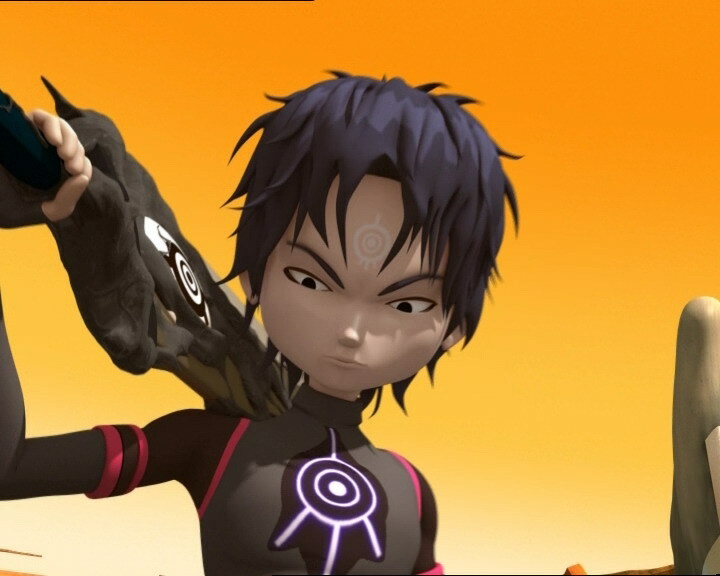 Yumi manages to destroy the Tarantula even though she lost one fan, and Aelita destroys a second, leaving one remaining before she can enter the tower. The clone manages to enter the lab but Odd is there to fight it, though he can’t hold out for long. At the same moment, Aeltia destroys the last Tarantula and enters the tower to deactivate it. William approaches Yumi and threatens to push her into the Digital Sea with his zweihander. Jeremy can’t devirtualise her because the Supercomputer was damaged in Odd’s fight with the clone. William caresses her cheek before shoving her into the void, Yumi grabbing William and taking him with her. Odd then arrives, also dressed in his new outfit, to catch her on his Overboard while William plunges into the Digital Sea. Not able to bring William back yet, Jeremy proposes they use a clone of him, as it’s the only solution that will convince the principal. There is now therefore a copy of William at Kadic. -First appearance of the new virtual outfits and of Aelita’s wings. And a new transition clip is shown featuring Aelita with her new wings. - First appearance of William’s father, James. - Jim states that Jeremy has far surpassed the absence record for every sport in gym class. - William’s father is worried, because his son hasn't been responding to his phone calls. - The principal sometimes takes breaks from work to play childish games on the computer... He also thinks that Yumi and William are very close to each other. - One of the windows in the science building changes between two shots. - The door to Jeremy’s room is blue instead of gray in the beginning. - Mrs. Hertz’s glasses aren’t the same when we see her. - William can be seen in the last row of Mrs. Hertz’s class, which is impossible. - Jeremy’s computer mic is on his left ear even though it was to the right when he was using his vocal synthesiser. - Jeremy’s factory mic changes often (with or without a wire), one part disappears when Jeremy says “Oh no” and it disappears from his left ear when he transfers Ulrich, Yumi, and Aelita. - Ulrich reads the same comic that he read in the previous episode. - Yumi’s new cellphone is apparently based on a Nokia 5300. Isaac Newton (1623 - 1727) was an English philosopher, mathematician, physicist, and astronomer. He perfected numerous inventions and made multiple discoveries. He has most notably discovered the theory of gravity. Newton made his theory after having been awoken by an apple falling on his head after he fell asleep under an apple tree. - The video game music to the game that the principal was playing comes from the game “Pac-Man,” a very well-known video game created in 1979. The goal of the game is to move Pac-Man, a character in the shape of a pie, around inside of a maze, and to have him pick up all the pac-dots while evading the ghosts. The Incredible Hulk is a character from a comic strip with superhuman strength. Odd: So then, the guy gets up and starts to scream, “Oh no my canoe just sprang a leak!” Hahahaha! Come on, that’s hysterical! The guy thinks his canoe sprang a leak! Oh forget it, you guys have no sense of humor. Ulrich: We do. That’s the problem. Yumi: Don’t worry, Odd. A sense of humor comes with growing up. Odd: Come on, I’m the funniest guy in school. In fact, if I wasn’t me, I would be president of my own fan club. Mr. Delmas: Delmas Academy, Jean-Pierre Kadic here, uh... Kadic Academy, Jean-Pierre Delmas speaking. Jeremy (using his vocal synthesiser): This is James Dunbar, William’s father. I’m calling to say that my son won’t be able to attend school this week. He’s got a very high fever, and he has to stay in bed. Mr. Delmas: Oh rats! I hope it’s not game over for him. Uh, that is to say nothing too serious. Odd: Well, now that we handled Delmas, maybe we can go to more important stuff! Jeremy: Odd, I know that you’re a walking stomach, but I haven’t got time to go to lunch. I have to get to the factory to test out the latest codes for your new equipment. Odd: Can you program me some bell-bottom pants with an orange stripe on the side? Jeremy (irritated): Will ya? I need a little thinking time! Nicole: It doesn’t look that hard, sir. There we are. Mr. Delmas: Hmm, by the way, Nicole, don’t you have some work to finish up? Mr. Dunbar: James Dunbar speaking. I’m calling you, sir, because I’m getting worried. I haven’t heard from my son, William, for several days. And whenever I try to contact him on his mobile, he doesn’t pick up. Mr. Delmas: Well, isn’t that a shame? I assure you I’ll do everything I possibly can to find your son. I’ll call the army, the FBI, even the president, so don’t worry! Mr. Dunbar: Well, there’s no need to go that far for now. Mr. Delmas: Now listen Mr. whoever alias Dunbar, you would do better to think about your own fate and not that of your so-called son once I discover who it is that’s calling! So there! Hear that, Nicole? That is the way you have to talk to practical jokers who enjoy playing tricks on you. Nicole: Hmm, there’s one thing I don’t get. How do you know that he was the practical joker and not the person you spoke to on the phone before? Hmm? Jim: Listen, Yumi, be honest with us. I know perfectly well that William isn’t any more sick than I am! Achoo! Jim: Sniff, thank you. If you wanna know what I think, I think William is somewhere, and something tells me that somehow you know exactly where that somewhere is and that sometimes it’s better to be honest with someone. So uno, somebody should tell William we know he’s around, and doso, he oughta get back before tonight. If not, Mr. Delmas, our beloved principal, will call some police! That oughta do it. Ulrich: What are you gonna do? Aelita: You’ve already finished all you had to do? Jeremy #2: Piece of cake, sweetie pie. Huh? What’d you think? Sure, I’m done. You’re lookin’ at the man. How’s it goin’, kid? You musta got all dolled up for me today. You wouldn’t believe the vibes I’m feelin’ right now. Yumi (who takes a step back): Hey, go back to being Jeremy, will you? Jeremy #2: It’s just that whenever I see you I don’t feel like I’m myself. Yumi: Anyway, you oughta know that your double has gotta be about the biggest flirt I ever met! Jim: Holy tolito, Belpois. I mean incredible, Belpois! How could you throw that thing so far with arms as scrawny as the wings of a chicken, huh? Mrs. Hertz: Jim! You’re worse than those barbarians who burned down the Alexandria Library! Jim: Yahoo! Yeah! I’m gonna be your personal manager, Belpois. Wait ‘til they get a load of this. You and me, we’re gonna go far. Trust me, we’re gonna taste the thrill of victory. We’re gonna breeze through the championships, the nationals, the planetaries, the interplanetaries, the intergalactics! Jim: Stern! Della Robbia! Go on! Pick yourselves a lane and let’s see how you run the 400 meters against Belpois. Jim: Della Robbia! You’d better be careful not to rough up my champion! You okay, kid? Jeremy #2: I’m good, Jim. Jim: Okay... Better safe than sorry is what I always say. Any volunteers to go with Belpois to the infirmary? Ulrich: I’m off to the factory with Aelita. Isolate Jeremy 2 and watch him. Odd (trying to keep the door shut with Jeremy’s double trapped on the other side): Oh great, here we go again. Hey, stop pushing, will ya? Dontcha like it in there? Odd (after just falling on top of the principal after being thrown by Jeremy #2): Thanks a lot for the psychology lesson, sir. Now I’ve gotta catch him. Aelita: Jeremy, you are the wind beneath my wings! Yumi: Aelita... you’re an angel! Odd: He leaves an impression wherever he goes. Yumi: Jeremy! William’s trying to push me into the Digital Sea! Odd: Hey, what do you think of my new outfit, huh? Odd: Yeah, that’s what I think too! Odd: Hopefully, William’s copy hasn’t developed emerging qualities like someone else I know. 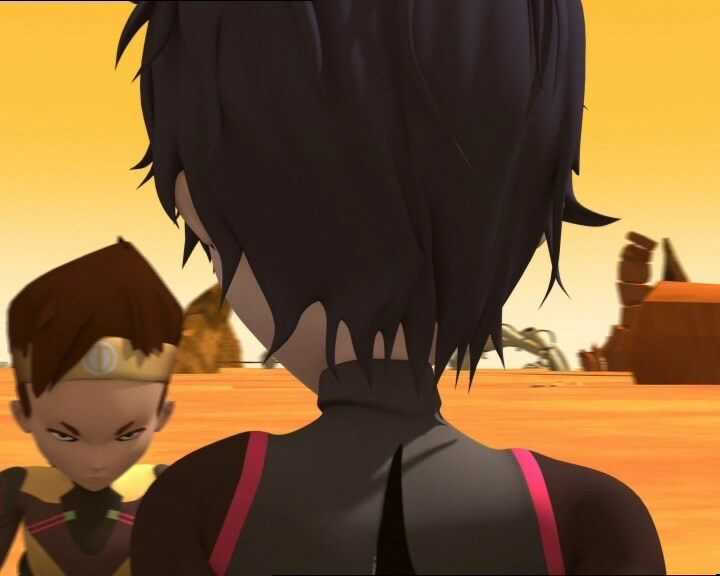 Aelita: At this distance, he looks normal. Mr. Delmas: Well, Dunbar, my boy, I’m glad to see that your fever has broken and you’re feeling well! William #2: Uh, did I break anything else? Mr. Delmas: Ah, hahaha! Uh, don’t forget to keep taking your medicine, say? Odd: Well, we’re not out of the woods yet!